Amherst, MA According to Hampshire College and Bruner/Cott & Associates the R.W. 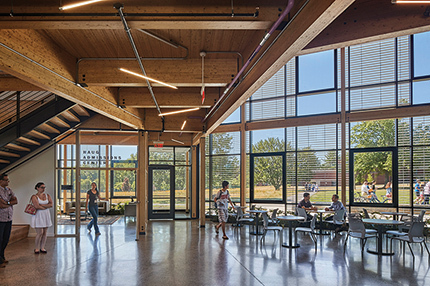 Kern Center on Hampshire’s campus has been certified as a Living Building by the International Living Future Institute (ILFI). The 17,000 s/f center joins just 16 other Living Buildings certified to date and is the largest Living Certified higher-education project in the world. This certification, which is the most advanced green-building standard in the world, was officially recognized at the Living Future unConference in Portland, OR, May 1-4. Architects from Bruner/Cott partnered with Jonathan Wright, founder and senior advisor of Wright Builders, Inc. and a Hampshire alumnus, who served as construction manager for the project. Its $10.4 million cost, including $7.4 million in construction, was fully funded by donations from more than 100 donors, led by the Kern family and Hampshire alumnus William Kern. R.W. 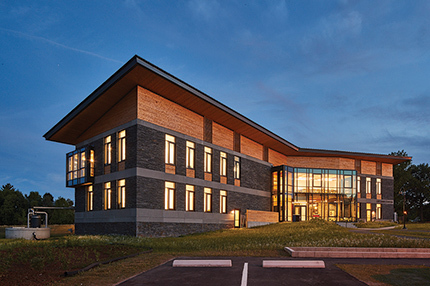 Kern Center project team: owner, Hampshire College; project manager, Carl Weber; architect, Bruner/Cott & Associates, Inc.; general contractor, Wright Builders, Inc.; mechanical engineer, Kohler & Lewis Engineers; electrical engineer, R.W. Sullivan Engineering; plumbing, Kohler & Lewis Engineers; lighting design, Lewis Lighting Design; geotechnical, O’Reilly, Talbot & Okun Associates; civil engineer, Berkshire Design Group; landscape, Richar Burke Associates; structural engineer, Foly Buhl Roberts & Associates; and interior design, Bruner/Cott & Associates. A multi-functional welcome center at the heart of Hampshire’s campus, the Kern Center opened in April 2016. Selected from more than 40 entries in the College’s design competition, the building was conceived to educate and inspire the next generation of leaders in sustainability. Its central double-height, glass-pavilion atrium houses a cafe?, lounge, and gallery, and maintains a connection to the outdoors with expansive views of the surrounding mountains. 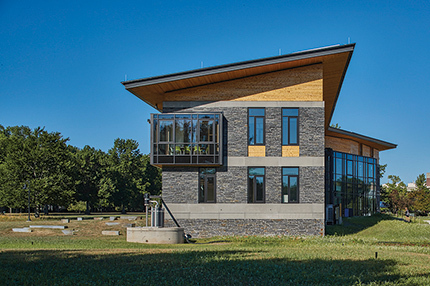 Two stone-clad wings house admissions and financial aid offices and classrooms with views of an amphitheater, rainwater harvesting reservoirs, solar farm, orchard, and wildflower meadow. With a rooftop solar canopy to generate electricity, the rainwater harvesting system to supply the building’s drinking water, and exposed walls in the mechanical rooms, the building itself is a learning and teaching laboratory for students and the public alike. • Net-zero energy is reached via the PVs on the roof, which generate about 17% more energy than the building uses. Energy design and monitoring has delivered results remarkably close to predicted energy use of EUI of 23.2 kBtu/sf/yr. • Biophilic elements include environmental features such as local wood and stone, natural shapes and patterns, use of light and space, and the place-based relationship of the building to the nearby mountain range on the horizon. • Red List compliant building materials, which avoid products made with toxic chemicals, are used throughout the project. • Beauty is inherent in the Center’s design, defined through its proportions, finishes, and sightlines. Playful elements such as puzzles are embedded in building elements. And the Kern Kafe’s tables are made from trees felled on the site. • The Kern Center’s website invites the public to its many open events and reports the building’s net-zero energy and water performance in real time to all through an online dashboard.